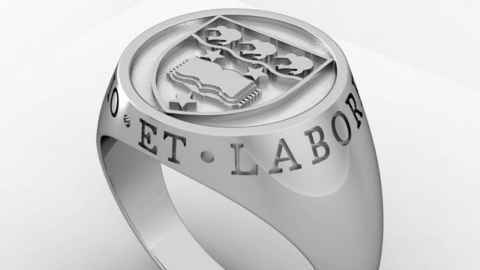 Represent your experiences, memories and hard earned achievements with a University of Auckland Graduation ring. They were first displayed at the 2008 Spring Graduation where they were highly regarded by the general University community. The unique design incorporates the Coat of Arms and motto – INGENIO ET LABORE (which when translated means "by natural ability and hard work"). It comes in a special two-piece display box which has the University of Auckland royal blue colour and the coat of arms. It can be worn with pride or displayed and passed down to your future generations. Each ring is custom sized to fit your finger and can be personalised with engraving of your choice. The ring comes in small and large (female and male) and can be made in sterling silver, gold and white gold. Note: Rings take between 4-6 weeks to be made and couriered to your home address. Only available to order online - Honour Rings do not have a retail stand during graduation days.